On two seperate Facebook groups we talked about comic strip ads by Bill Williams and Tom Scheuer (who changed his name to Dawyer when he became a television writer). 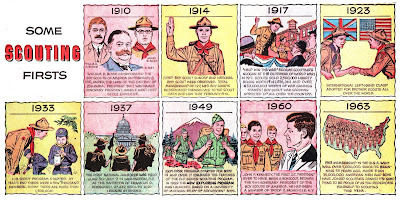 In my files I had a small series of ads for the Boy Scout organisation in 1964 b both gentlemen. It looks like something Johnstone and Cushing would produce, but if I am right they were disbandoned by then. 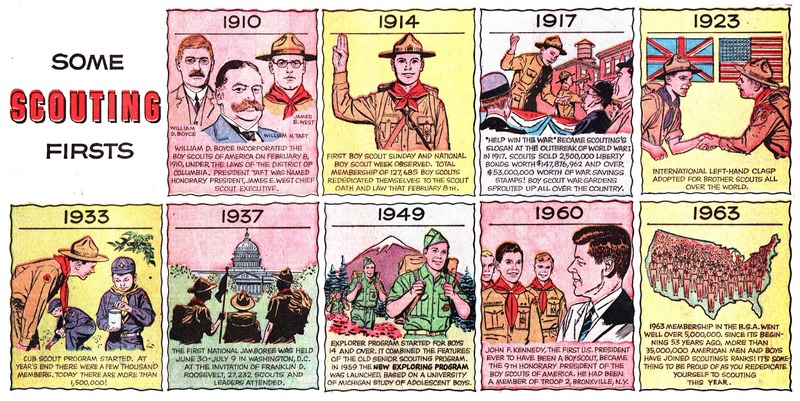 It may be a reworking of some pieces Johnstone and Cushing did produce for the comic section of the scouting magazine Boy's Life (although I do not recall seeing those in my collection or the online archives of that publication. Both attributions are my guess, but the seem obvious to me. Even the untypical realistic piece by Williams. The special Christmas Gift this time is an ad by Jack Davis I had never sene before.